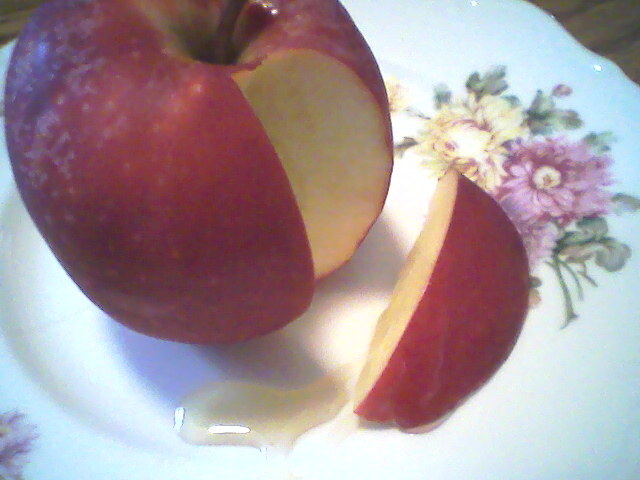 Yes, Shana Tova — “a good year” — to you! And may it be a sweet one. And blessed and magnificent. I like this idea of having a separate new year. I like it a lot. Lately, I’ve been in a “newness” frame of mind, letting go of toxins and disappointments, ready for this new season of autumn. I didn’t realize until earlier this morning that today at sundown started Rosh Hashanah, the Jewish new year. But it all blends together perfectly. And it makes me wonder if, during genealogy research, I really do have Jewish blood. : ) (I found a link to our family, generations ago, that claimed they were Jewish and came from Jerusalem, then settled in England, but they had no proof, just stories handed down to them. It would be wonderful to find out that this was true. I’d be a Messianic Jew then. Have always been drawn to Jewish culture and traditions, as that helps me understand more of the world of Jesus. It can get dangerous sometimes to interpret Scripture based on your knowledge only of the time you live in. For example, I once heard someone say how they were going to “put coals on the heads of their enemies,” figuratively, of course, based on a piece of Scripture they read. Well, that’s certainly not God’s heart — and little did they realize that that was a blessing — because baskets were often carried on the head, and if you gave someone coals on the head, it would be in a basket and they could use the coals to keep warm. (And I can’t remember where I heard that, but I do remember it was from a source I trusted.) But anyway. I digress. Again. I’m basing this artistic endeavor on Habakkuk 2:2, when God says to write down the vision. Instead of stone tablets, I’m using poster board. Instead of words, I’m using pictures. And maybe if they’d had magazines back then, He would’ve told them about setting it down in a collage. He might’ve. ; ) Also, Romans 4:17 describes God as “the one Who gives life to the dead and speaks of the nonexistent things that [He has foretold and promised] as if they [already] existed” (Amplified). I love that. For those promises that seem unfulfilled as yet or completely gone, there is still hope. And it’s always better to hope than to give in to despair. Just this evening, I read that one tradition of Rosh Hashana was to go to an ocean, river, or lake, and reflect on the times during this past year that you didn’t do very well, times when you messed up, and then to symbolically throw all that “into the sea,” based on Scripture. That reminds me of a friend of mine who was going through quite a bit in life, and rented a beach house to get away from everything for a while. She told me that one night she sat on the beach and had a long talk with God. Curiously, she felt Him ask her to go get a piece of paper and something to write with. So she just went with what she was feeling and did it. There she now sat with her paper and pen. And she waited. She felt she was supposed to write down everything that bothered her, all the times she messed up, all the things she had against some people in her life, everything little thing that was worrying her. So she did. She tore that page into little strips of paper and wrote everything down. And she waited. Then she felt Him ask her to go find rocks and twine — and, yes, she felt she was supposed to tie each of her problems to a rock. Now she was having fun. She knew what would be next. And sure enough, yes, she felt instructed to throw them all into the ocean. She told me she had fun with this. Yelling, laughing, throwing those darn rocks as far out as she could. And then she turned happily around, feeling so much better, and headed back to the beach house, ready for, hopefully, a good night’s rest. But then she heard His voice again. She didn’t move. She was stunned. “What do you mean, ‘Go get them’?! So she argued. She argued with God telling Him how ridiculous and horrible and what an awful trick — and then she burst into tears. “NO! I can’t do that!” she yelled at Him, and sunk down to the sand. Silence. Complete silence. For a moment. Enough to make her listen again. Enough to reassure her that God doesn’t play tricks, that He loves her with an undying, forever kind of Love. That there are always reasons to what He says. Good reasons. I really like this link: http://www.ecologycenter.org/factsheets/cleaning.html. Since I’m not fond of cleaning with chemicals, this offers many natural “recipes” — like using baking soda, vinegar, and hot water to unclog a drain, which I just did this evening. Fun when you can do what needs to be done in relatively safe ways and that aren’t expensive. And fun to watch the vinegar and soda fizzle like a volcano. ; ) So many uses for these products, and for lemons and limes and other household items, like toothpaste. When tragedies of this scale happen, a part of me freezes. It’s not that I don’t feel anything; I do. Last night, while watching documentaries about September 11, 2001, it hit me all over again, like a wound that hadn’t healed all the way, one that had a scab ripped off once more, and the tears flowed yet again. I didn’t know anyone personally who died or survived those direct attacks, but several friends did. The grandson of one of my mom’s best friends was one of the heroes. He worked in one of the Twin Towers and helped rescue a woman in a wheelchair, getting out just in time before the collapse. Another friend, a flight attendant, knew one of the flight attendants who was killed. Friends in the military and those living next to bases shared what they witnessed. Other friends lived in Manhattan and saw firsthand the devastation. And reading all the tributes and remembrances by friends on Facebook today, so many other friends too … all painting vivid pictures of where they were when it happened, and how it affected them, with some telling about those they knew and loved who had died or been rescued or had escaped, or of what they witnessed in person. As Americans and as human beings, we were all affected that day … and we will never forget … because we can’t … and shouldn’t. I’ve been spending this 10th anniversary in reflection and a bit of prayer. I watched the Memorial Service this morning and have read some accounts and watched more documentaries today, listening to stories I hadn’t heard before, including amazing, miraculous ones in the middle of anathema. 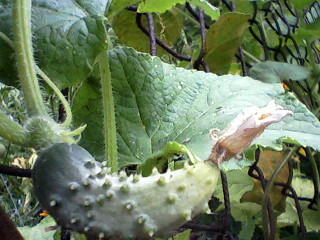 This is what this little cucumber looked like on August 15. And it still looks like that. Not even as long as my thumb. Yeah, I planted them too late in the season. The gardening-center specialist assured me it wasn’t too late for starting cucumbers from seeds, and she was probably correct — so maybe I just didn’t plant them in the right place where they’d get enough sun for this time of year. I watered them, and there are more blossoms, so I’m not giving up on them… We’ll just have to see what happens. Isn’t that like all of life though? There’s always a perfect season for everything. Everything under the sun has its special time and length of days. And if you miss that time, then you have to wait ’til the next growing season or start something else that is in season. Everything good takes time and nurturing… The right conditions produce so much in all aspects of life… A tomato plant can’t grow outside in a cold climate during winter. And kale doesn’t like the summer. But plant them in the seasons they were meant for, and in the right type of soil, with the right amount of water and fertilizer, and watch them flourish. Sometimes those plants might do really well with composting or worm composting too. I know I often talk about using our gifts. And maybe that’s because I see many people doing what someone else expected of them, or doing what they expected of themselves, when they didn’t expect much of themselves at all, and now they’re restless or bored or depressed. Or chasing another person’s gift and not their own — like someone who wants to be a singer and pursues it with passion … but they’re tone-deaf… For whatever reason, they didn’t or couldn’t see their unique gifts that are equally as wonderful as those in others. But sometimes, maybe people aren’t using their gifts yet because the timing isn’t right. Maybe it’s just that the gifts aren’t ready for harvest… You could be 20 or 80, but if the timing isn’t right, the harvest won’t be good. Every now and then, you’ll hear in the news about someone who’s been on this planet for many decades — and is just finding their passion, like getting a degree or publishing a book or recording an album. That was their special season. Maybe part of their gifts were to show us that it’s never too late to step out in faith and develop what’s in our hearts. Maybe all the seeming delays and seeming setbacks that some people experience are only growth stages… Maybe the gifts that some people thought weren’t there or thought were dormant and dead are just about ready to push through. Perhaps they’ve been growing deep and strong roots all this time — and now is the time for discovery, to see what those gifts are clearly. Discovery is an ongoing process, so there’s always hope. And each person’s time of discovery is each person’s perfect time. I like when God uses nature to encourage us. I like when He gives us all the opportunity to learn and grow and discover what’s good at the right time… And when He sometimes steps in to surprise us with what we would call a miracle (like the azaleas that bloomed when they shouldn’t have this past spring — see “The Miracle of the Azaleas” from April 8). 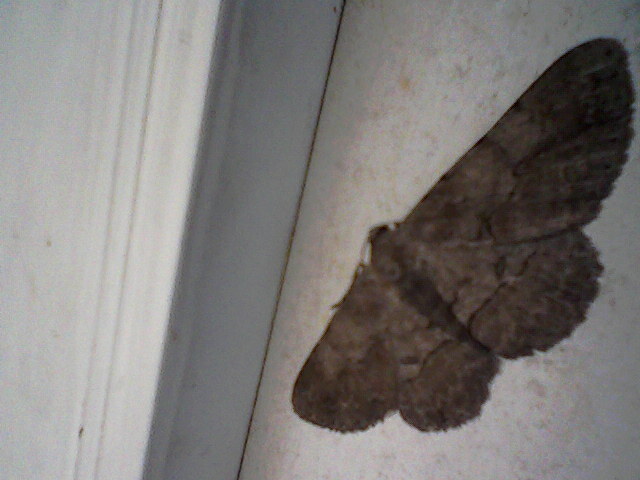 Saw this pretty moth resting on the outside door. From the smallest and seemingly insignificant to the most majestic of God’s creations, we’re all loved by Him and are precious. Nobody escapes His eye. And just when you think you’re not seen and are overlooked by Him, He causes light to brighten in our lives. Even a little speck of it.